Cook a dish that the whole family loves! 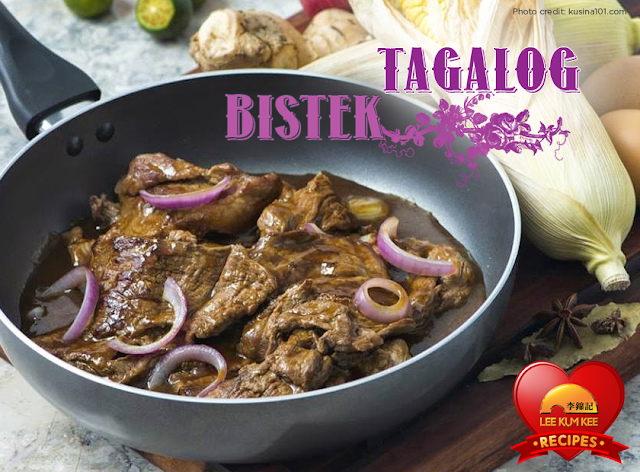 Bistek is a dish that originated in the Philippines and was made by the folks of Tagalog regions. A tender cut of beef like tenderloin, sirloin, or round (top or bottom) is recommended for cooking Bistek Tagalog. 1. Marinate the beef in Lee Kum Kee Premium Soy Sauce, Panda Brand Oyster Sauce, calamansi juice and crushed garlic for several hours or overnight. 2. Heat pan with vegetable oil. Add the onion rings and fry for 1 minute. Drain in a paper towel and set aside. 3. Remove the beef from the marinade and using the same pan, under medium heat, fry the marinated beef until brown. Set aside. 4. Pour the marinade mixture into the pan and allow to simmer until reduced. Then add the fried beef and cook for 1 minute. 5. Serve over steamed rice and garnish with caramelized onion rings. Enjoy!